The Best Electric Bicycles Explained – TOP 10 reviews, tech specs, ratings and much more. Discover the best Best Urban Electric Bicycles of 2018. The bicycle scene has improved a lot in the past decade bringing design and technology innovations to the community. Electric Bikes are used for sports, commute, delivery and leisure. Many opt for e-bikes as the means to get to work or school. In Urban nucleus biking is cheaper, greener and faster than using a car. Electric bikes have evolved achieving higher speed, range, battery charging times and stability among others. From everyday models to designer masterpieces bikes are gaining terrain in the cities and suburbs. Two wheels, a helmet and a road. These are all you need to get from where you are to where you need to be. Electric Mountain bikes have drastically changed the city’s landscape thanks to technology, concern for the environment and safety. The electric bike segment has grown both in sales and distance travelled because its a convenient way to get around and costs much less than a car. It also provides a sweat-free commute. The best part? E-bikes are now built like warriors. You will find below cleverly-designed models that can take you through most inclines and even rough terrain. Check out GearScoot’s roster of e-bikes kits for a model that’s right for you. A number of factors come into play. What’s your routine like? What are your riding habits? Do you frequently ride through hills or inclines? Will you be using your bike to get to work? Do you walk a flight of stairs? Do you have ample storage space at home? At work? The best electric bike is one that suits you and your lifestyle. We’ve road tested these e-bikes and we were hard-pressed to decide which ones to leave out. So do give these models a spin and see which one feels best for you. We had a blast trying them all! Here are our picks for the TOP 10 Electric Bicycles! The E-go Fat Tire tops our list. If it is power you want, then it is power you get. This heavy-duty e-bike is pure muscle. With 58 lbs of premium parts (Shimano speed system, excellent rear brakes) it can carry loads of 160 lbs. Customers love this model for the gorgeous design and versatility. Take it for leisurely strolls by the beach. Pummel through snow. Or simply ride to work or school. This bike’s tires provide an even and smooth ride. The ProdecoTech Phantom X V5 takes the 3rd spot for its power and acceleration. Featuring a streamlined design, this US-made bike can take you to speeds of up to 25 mph. Hydraulic brakes are smooth and overall safety features are on point. Some customers want the basics of a great e-bike but put a premium on foldability. It should be quick to fold and compact. If these requirements are on the top of your list, then this e-bike is for you. Take it with you for that holiday. Or why not use the Goplus 20” to work or school. With its quick-release clamp, you can simply fold in a sec and go. But don’t take this compact bike for granted. The Goplus 20” can take you to distances of up to 18.60 miles. Not bad for a folding bike! The Goplus 180W lightweight is our top pick for the lightest folding e-bike available on the market. This model can transport up to 165 lbs and has been reviewed as a very efficient ride. Perfect for the student who needs to get around campus (and climb a flight of stairs with it!). With 9 levels of pedal assistance, the Greenbike USA GB5 is the most versatile in this list. All components in this e-bike are top brand bicycle parts. With the battery off, it’s a regular bike without the drag. With 6 levels of pedal assistance and speeds of up to 22 mph, the Magnum Bikes Premium 48V is a monster when it comes to climbing hills. It is easier to mount compared to other models and is popular for its sturdy build and riding comfort. With a 500W motor lithium ion battery hidden in its frame, this e-bike is a good contender when it comes to rain and snow. 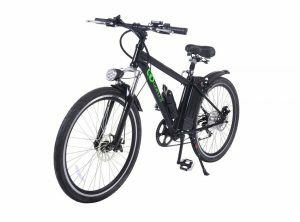 This model is a great buy for its features and with its 20 mph and 9 level speed assistance you’re looking at a safe and reasonably-priced e-bike. The Addmotor MOTAN is such a versatile bike. Its design can adjust to a wide range of rider heights (5’2” to 6’6’). The load capacity on this model is 300 lbs. The Addmotor MOTAN can run to speeds of up to 23 mph and go as far as 55 miles on a single charge. Last but definitely not least is the VILANO ION, a great entry-level folding e-bike. Novice users will love this model for its maneuverability and quick-fold features. An e-bike requires less effort. Arrive at your destination fresh and sweat-free. Need to climb hilly roads? No problem! These handpicked e-bikes have proven their worth in this list. You can say goodbye to having a change of clothes when you get there. Here are the TOP 3 models for city commute! City commutes should never be complicated. You want a lightweight e-bike that folds into a compact size. You don’t want to think about storage. Climbing flights of stairs should also be the least of your worries. With this in mind, the Vilano ION takes our top spot. With a maximum range of 30 miles, a 7 speed drive train and a 250W brushless hub direct motor, the Vilano ION is hard to beat. The Genesis Commuter Electric Bike is a powerful, folding e-bike that comes with all the bells and whistles you expect: 14” tires, LED headlights, adjustable handlebars and a 240W brushless DC motor. With pedal assistance, expect to cover a range of up to 38 miles on a single charge. The price on the Pedego City Commuter Classic can get intimidating, but hear us out. This state-of-the-art e-bike is the best in its class when it comes to hill climbing and acceleration. It is a lightweight model loaded with top-of-the-line bike and safety parts. Features include a twist-and-go throttle, powerful disc brakes, 5 levels of pedal assistance and premium balloon tires. A USB charge port is included to charge your devices. When you want power, solid durability and the ability to go off-road, you don’t need to take e-bikes out of your options. They now come as rugged as its manual counterparts. These e-bikes made it to our list for their design, battery power and mileage. Here are our TOP 3 e-bikes for sports and adventure. 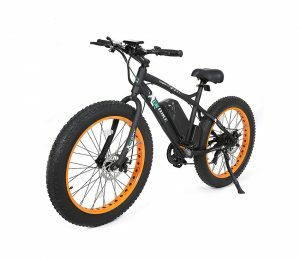 This electric mountain bike that features a collapsible aluminum alloy frame, anti-rust and anti-exposure body takes the top spot in our list. 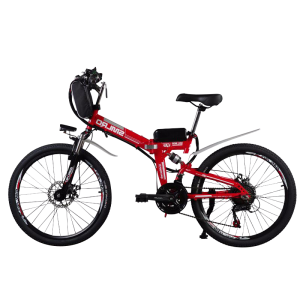 It has a large capacity battery, ultra-strong wheels with anti-slip qualities and a mechanical front and rear disc-brake design. It’s a great bike for riders who dare to climb snowy mountains. With this said, the ANCHEER Folding e-bike works great for both the urban and outdoor rider. Sometimes, you just don’t anyone to know that your ride is powered by a strong motor. Well, they don’t need to know. With the ProdecoTech Phantom X2’s concealed battery, your ride looks just like your regular bike. Ride as far as 30 miles at speeds of up to 20 mph. Get a great workout with this bike. Tired? Cruise with pedal assistance. Choose from among 8 speed settings. The Ferty 2017 is 100% aluminum alloy and packed with premium comfort shock absorption. A 3-speed smart meter button and several high-end bike components make this e-bike a top contender in several lists. Ride as far as 37 miles or 60 kilometers on just a single charge. For the longest time, foldable e-bikes have never really been the most popular type of bike. Road riders used to prefer their heavier, full-framed brothers thinking that foldability equates to fragile parts. Lately however, foldable bikes are fast populating streets and neighborhoods, thanks to innovation, cutting-edge design, as well as congested urban areas. A folding bike does exactly what you expect – it folds. It takes less space for storage. If you need to ride public transport, a foldable model is easy to carry inside a bus or train. Most models fit inside a car’s trunk. 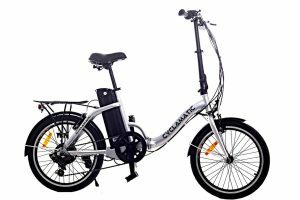 The best foldable e-bikes combine convenience (lightweight, compact, easy to carry up a flight of stairs) and durability (sturdy hinges and joints, powerful motor) at a reasonable price (best brands, great features). We’ve done the work for you. Here’s our TOP 5 for the most compact, lightweight, sturdy and reasonably priced folding e-bikes. Fat tires don’t mean, large storage spaces. You don’t need to choose between having a compact bike and smooth rides because this e-bike lets you have both. The Ancheer folding electric bike has 4 to 5 stars ratings when it comes to design. It’s easy to fold and is a joy to ride. This is a great model for novice users too. The Vilano NEUTRON is a subtle folding e-bike. If you hate the attention but love the bells and whistles, this is the model for you. It’s safe, elegant and powerful. The Cyclamatic’s easy folding features make it ideal for holidays. Take it with you in a bus or train. Or simply, fold and put this e-bike in your trunk. Go sight-seeing with this model. Its limited speed is a safety measure. The Goplus 20” can accommodate weight capacities beyond what it claims in the manual. 370 lbs on a lightweight frame? This model is a keeper! When it comes to kids and teens, you want a balance between thrill and safety. You want brand parts you can trust. You also want maneuverability and ease. Here are our TOP 3 e-bikes for kids and teens. 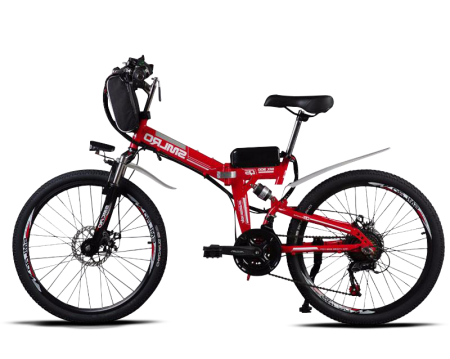 The Goplus 20” 250W e-bike makes for a great school buddy. It’s affordable, has the basics of a good e-bike and folds in two seconds thanks to its quick-release clamp. The mileage on this one is 18.60 miles – that’s a good distance on a single charge! The lightweight Onway 7 Speed 700C Woman is a great bike for the older teen. Don’t be misled by its name. 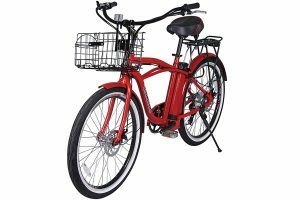 This e-bike is a great unisex bike that features a 40 mile maximum distance with pedal assistance. Your teenager will love the Shimano 7 speed gear system on this one. The X-Treme Scooters Newport Beach Crusier Lithium Electric Powered e-Bike is a great bike for students. It features lots of storage, ample carrying space and a no-nonsense design. Run errands. Travel to and from work. Go around campus. Pedal manually or switch to pedal assistance. This e-bike is a reasonably priced model for its features. Distance per charge is around 20 to 25 miles. 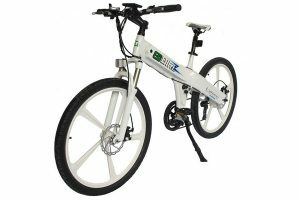 Hybrid electric bikes blend characteristics of the more specialized road bikes and mountain bikes. The resulting “electric hybrid” is a general-purpose bicycle that can tolerate a wide range of riding conditions and applications. Who’s it for – hybrid e bikes are the perfect fit for those who want something smaller and lighter than a fat tyre mountain bike but larger than a foldable bike. 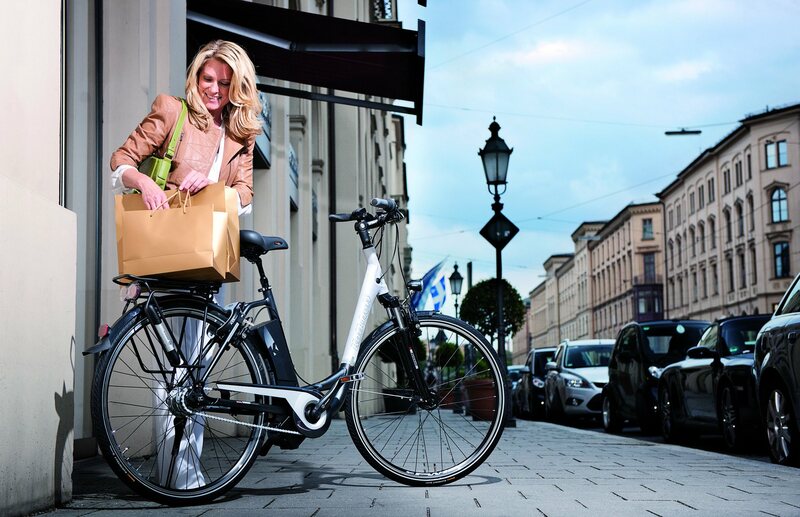 If you are looking for a more comfortable riding experience the city cruiser e bikes might be a better choice. Allows for plenty of saddle height adjustment to suit the rider and is fitted with a quick-release. 6 speed shimano gears & shifter system. Range per charge 25-35km with pedal assist. 30 Mile Range at 20 MPH using Power Only. 36v 400 Watt Direct Drive Motor. 36v 10.4ah Samsung Lithium Batteryo. Rigid Down Tube Aluminum Frame & RockShox 100mm 30 Silver Suspension Rear Geared 600W Motor & Continental Traffic Tires 26×2.1″ PTECH Samsung 36v 14.25Ah Downtube Battery.